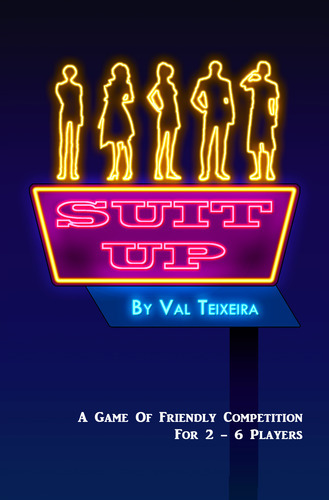 Suit Up is a game by Val Teixeira and will soon be up on Kickstarter. It is for 2-6 players. In this game, players will be trying to expand their character’s social network in a bid for the title of most awesome person in the city. Players will be traveling around the city as they try to gain different types of influence to gain new friends. The player that can draw the best crowd will be declared the winner. To begin, the game board is placed in the middle of the play area with the map side face up. The favor tokens are placed in a stack beside it. The time token is placed on the start time slot with the pale side face up. The People cards are shuffled and placed face down in a stack above the board. 4 cards are flipped over from the top of the stack and form a line to the right of the deck. If more than 4 people are playing, a second line of 4 cards is placed above the first line. The Crowd tokens are randomly placed pale side up on each of the long spaces at each location on the board. The Score card is placed face up beside the board. Score tokens are randomly chosen and placed beside each corner of the score card. The Security token is placed on top of the crowd token that provides the most Influence based on the numbers provided by the score card. Each player then draws 2 People cards. They each reveal the last People card that they drew. The player whose People card is first in alphabetical order takes the Starting Player token. The revealed cards are returned to the player’s hand. In reverse turn order, players take a player board of their choice along with the matching player token. Each player chooses which side of the board that they will use. They will then place their player token with the corresponding side on the Home location of the game board. Each player receives 1 of each influence token which are placed with the unnumbered side up on the 0 slot of their player board. Players then move their corresponding influence tokens as dictated by their player board’s unique ability. Play now begins. On a player’s turn, they will perform a couple of simple steps. They will move and collect. At any time before or after either of these steps, they can activate a favor token, if they have any. The first step is to move. This is done by simply moving the player token to an empty space on one of the locations on the board. In games with 4 players or less, there is only 1 available space for each location. If another player’s token is there, you can not move your player token there. Players can also move back to the home location at any time. As a matter of fact, this is the only way to make friends, which I will explain in just a bit. Even if other player tokens are at the home location, it is always available to be moved to. The next step is to collect. This is done by moving your influence tokens on your player board the amount shown on the space that was moved to. Favor tokens are also taken if they are shown at that particular location. A player will gain 1 influence of the shown type for each symbol shown. They also gain 1 influence for each benefit symbol shown of the same type on any of their face up friends cards. The player moves their influence tokens on their player board to indicate that they have added the corresponding influence. Once a player goes above 10 in a particular type of influence, the player simply flips the token over to the side with the 10 on it and continues moving the token to the correct amount. There are 4 types of influence and 1 wild which can be of any type. A player also collects the corresponding favor token if the location shows it. If there is no more of that particular type, the player may choose one of the others. If a player already has a favor token, they may not collect another until the previous one is used. There are 4 different types of favor tokens. Each one does something different from swapping crowd tokens on the board to discarding people cards in the display. One favor token even allows a player to take the small starting player token, swapping it for the large one at the end of the round. This allows them to be the new starting player. Making friends is the main objective of the game and the only way to score points. To make friends, the player moves their player token to the home location. They will then choose a people card from either their hand or the face up display above the board. They must then pay the cost of their chosen card by paying 4 influence per influence symbol of the corresponding type unless it is one of the 2 right most cards in the display. In this case, 3 influence is paid per symbol instead. The player moves their influence token on their player board to correspond with the amount of each influence used. The people card is then placed face up beside the player’s player board. They are then able to use the benefits provided by the card. The remaining cards are shifted to the right and the display is refilled from the deck. If a player has less than 2 people cards in their hand, they will draw back up to 2 people cards. Players can also discard cards before drawing new cards. This completes a player’s turn. Once a player has completed their turn, the next player follows the same set of steps. This continues until each player has taken a turn. At this point, the round ends and the crowd tokens adjacent to the security token swap places. The security token then moves to the next clockwise location. The time token then moves ahead clockwise as well. This begins a new round. Once the time token has gone completely around the board and lands back on the start space, it is flipped over to the dark red side. Each one of the crowd tokens are also flipped over to their dark red sides as well. Once the time token makes it back around the board a second time to the start location, the game ends. With this being a prototype copy, the pieces are final. With that in mind, I have to say that I’m rather impressed with what was presented here. The board is a rather unique design but everything is laid out quite well. The different tokens and pieces all look quite neat. The cards are extremely well done. I love the shadowy silhouettes on each one. It gives the implication of a certain type of person without all the fancy design. The artwork is really great. I really like how each influence is represented from brains to strength, money to suits. Each player board is unique and carries over that silhouette idea. It matters which side you choose as well as the female side is different from the male side for each archetype. For instance, the male athlete starts with 4 muscles, but the female can place their token on any open space as their move. In the advanced game, this matters as the player can only move to one of the next 3 clockwise locations. Needless to say, I really like the details in the design and I think that there was an excellent job done here. The rulebook for this was a simple design stapled together. Even so, it looks really nice. Everything is laid out really well and was even in color. There are a lot of pictures and examples throughout the book. Everything was laid out really well. All the different pieces from the individual player boards to the favor tokens are explained in great detail. There was nothing difficult to understand at all. I like that there is an advanced game included. There is also an overview of how to play the game as well as how to make friends. All in all, I think the rules look quite nice. The game is really fun. I quite enjoy playing it. It has a real nice worker placement feel to it. It’s pretty simple to learn and play. The design is really neat. I like how that players don’t move their player token until it’s their turn which makes it where certain spaces will still not be available. It’s quite strategic in that way. You really have to think ahead of what you need and how to get it done. As you’re starting out you start trying to get yourself running to where you can get extra influence. From that it’s all about getting those friends paid for so that you can score points, usually the higher the better. As I played, I found myself many times fighting for the same friend cards, racing to get the proper amount of influence to be able to pay for them. The game isn’t that long to play. Most sessions last around 45 minutes. It was really fun to play. I like the theme and it doesn’t really feel forced but it is present. I tend to think that if Facebook made a board game, this might be what it hoped to achieve. All in all, a really good game. Suit Up is a light to medium weight game of making friends with a worker placement feel. It’s not that difficult to understand and it can be played in around 45 minutes. The artwork is really unique and quite good. I really like the silhouette style on the people cards and the player boards. The theme is quite good and makes me think of making friends on social media. Fans of worker placement style games should really enjoy this one. The design is really fun and easy. I enjoy it quite a bit. This is definitely a game to keep an eye on. I would definitely recommend it. I’m sure that the finished game will look even better than the prototype does. It is one that should be played and enjoyed by everyone. For more information about this great games, please check out the game entry on BGG where you can download a free Print and Play version of the game. This entry was posted in Preview Reviews, Print and Play Productions and tagged board, board games, card, card games, games, suit, suit up, Teixeira, up, val, val teixeira. Bookmark the permalink.